A small oceanfront and bayfront city and community of just 1 square mile, settled in between North Miami Beach to the south, and the exclusive Miami Beach Village of Bal Harbour to it's north. A population of just over 5,900 from the 2012 census. Low-rise condos, hotels and some commercial properties enjoy the beachfront section of Surfside, while the single-family homes are located either directly on the bay to the west or a block or 2 walk from either the ocean to the east, or bay to the west. Surfside features a small business district off the beach that locals and visitors often visit for the restaurants, art galleries and small boutique shops, located just between the ocean and the bay. The small bistros in Surfside welcome all for a casual meal. Just south of Surfside, Florida, the North Shore State Recreation Area offers an unspoiled beachfront nature preserve and picnic area. Surfside also features it's own dog park, children's parks, along with a lovely and popular oceanfront community center. As the Surfside beach has long been a nesting spot for ocean turtles and as part of the city's Art in Public Places initiative "Tales of the Surfside Turtles" is on view in the town's business district on 93rd Street between Collins and Harding Avenues. Featuring fiberglass turtles created by local artists, the project brings awareness to the endangered loggerhead turtles indigenous to the area. The turtle sculptures are unique and display a range of artistic creations including underwater escapes, mermaids, and vibrant abstract drawings. The world class shopping and dining at the world-renowned Bal Harbor Shops are just across the street from the northern boundary of Surfside. A very short walk indeed. Incorporated in 1935, Surfside boasts many stylish homes built in the ever popular Miami Beach Art Deco style. The Greater Miami Beach oceanfront town of Surfside currently has 2 new luxury condominium properties recently completed on previous commercial, apartment and hotel beachfront locations. One of those developments is at the historic, and once private, Miami Beach Surf Club. This new development included restoring and renovating the historic (and protected) original Members-only Miami Beach Surf Club building while integrating 2 new luxury condominium buildings and a 5-Star Four Seasons Hotel perfectly placed into a section of the available space in the large 6+ acre oceanfront lot. 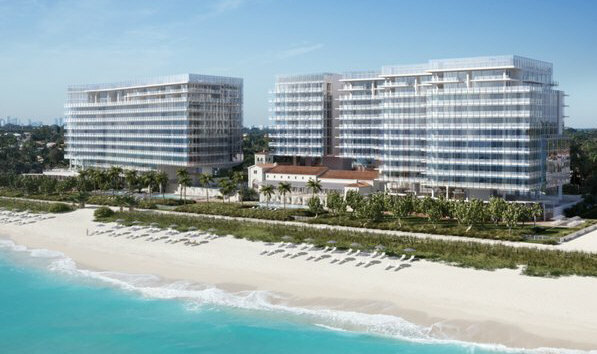 Rendering of the Surfside Surf Club Condos & Four Seasons Hotel shown at right. When viewing the photos for this oceanfront project, you will see that much of the original beachfront open space is still utilized for maximum outdoor enjoyment with multiple pools, lavishly landscaped decks, gardens and lawns that reach out to the beach, and ideal placement of the original Surf Clubs newly renovated oceanfront cabanas. As a historical side note - Winston Churchill stayed at the Surf Club in 1946 and painted oceanscapes within these cabanas. With the Surf Club condos & Four Seasons Hotel designed by the world-renowned architect Richard Meier, it is truly a beautiful and one-of-a-kind luxury Miami Beach oceanfront property. The FENDI Chateau Residences Condominium (shown at right) is another Surfside recently completed luxury developments. 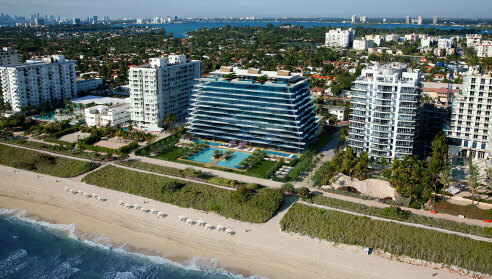 This luxury oceanfront condominium property was developed by the Chateau Group - The real estate investment and development entity, which is based in Hallandale Beach FL, spent $50 million to purchase the multiple parcels in Surfside on which it built The FENDI Chateau Residences. With just 60 luxury residences the floor plans are spacious and luxurious, with each floor plan offering "flow-thru" designs for both oceanfront terraces and western side sunset terraces. The 3 top floor penthouses each feature their own private roof top pool, large landscaped deck with summer kitchen and more. The Chateau Group had previously completed the luxury Chateau Beach Residences condominium just 2 miles or so north on Collins Ave. directly on the ocean in Sunny Isles Beach. The new condominium developments in Surfside are unique to many other Greater Miami-Dade beachfront developments as Surfside's building codes only allow buildings up to 12 floors, and as such all new condominium properties are not the large hi-rises we most often see in many areas up and down the Miami-Dade and Broward County beachfronts, but are smaller "boutique" style developments, thereby providing a much more private condominium property to call home. Smaller condominium properties in Surfside does NOT mean less luxurious, as all of these new Surfside condominium developments have planned, and are offering exceptionally high quality details, features and amenities to rival and often surpass those found in the much larger developments up and down the beach areas of Miami Beach, Sunny Isles Beach and up the coast to Palm Beach. 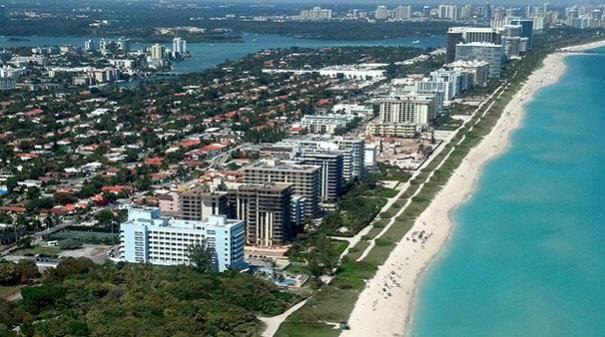 Sunny Isles Beach is an oceanfront and waterfront neighbor directly to the east of beautiful Aventura. Our featured Sunny Isles Beach Condominium residences include the luxury oceanfront properties of - The Acqualina Resort, Trump Grande Resort, Trump Towers and many other established and newly completed luxury condominium properties. "For all your Surfside, Miami Beach Condos, Homes & South Florida Real Estate needs"